Robert Gülpen has made a 1:8 scale replica of the Lamborghini Aventador LP 700-4, using carbon and platinum gold. If that were not enough, the model car maker added precious stones to his creation. “High-tech work of art” is indeed an apt description for what he has made. Take a closer look. 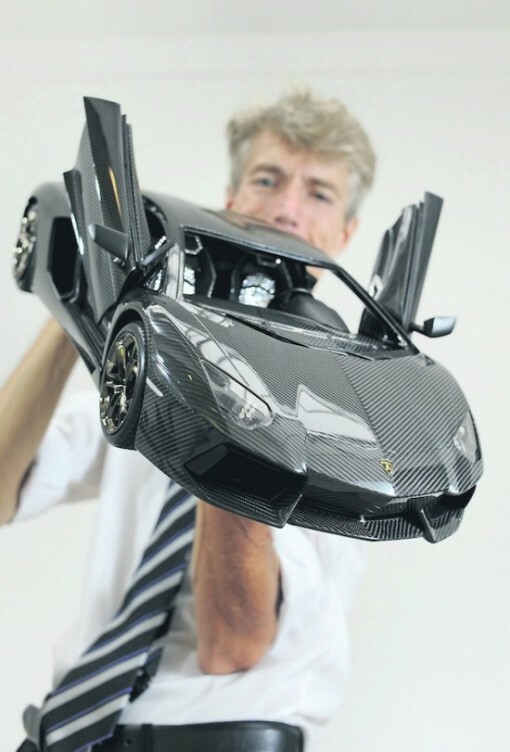 As you can see, the body of the miniature Lamborghini Aventador LP 700-4 is made of carbon – not unlike the real car that you can drive. The steering wheel, seats, and headlights have diamonds embedded in them. Combined with the precious metals used in the miniature, the diamonds cost about 2 million euros! Now compare that to the price of the real car, which is 303,450 euros. But that is not the actual price of the miniature car. It is supposed to be auctioned off by Sotheby’s later this year, in December. The starting price is reported to be 3.5 million euros! With the auction going to be held in ether Dubai or New York, there certainly are going to be some takers. Oh, and in case you have little patience and tons of cash, you can get the miniature for a whopping 4.5 million euros without having to go through the auction. Now if you are like me – who cannot even dream of having that much cash to spend on something more substantial – then you would have to be content with merely gazing at those pictures. Alternatively, if you can make it to the Frankfurt Motor Show, you can catch a glimpse (or maybe a longer look) of the Lamborghini Aventador LP 700-4 Model this month. Don’t even be tempted to touch it, though, as it will safely ensconced in a bulletproof glass case.